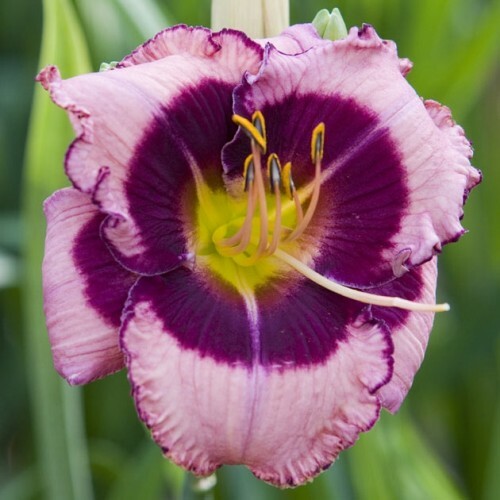 This beautifully coloured daylily is certainly dramatic! The frilly pink petals are edged with dark purple and reveal a large dark purple centre. And to quote Macbeth, these rebloomers shall flower "Tomorrow, and tomorrow, and tomorrow." All parts of the plants are edible though it is the flowers that are most frequently used. Daylilies also have a number of other uses and, all in all, deserve to become a standard plant in edible and ornamental gardens. Re-blooms. Tetraploid.